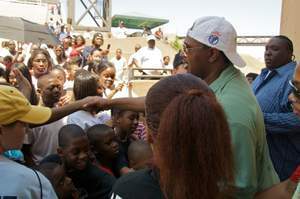 MEMPHIS, TN--(Marketwire - August 4, 2008) - The crowd was dominated by elementary and middle-school aged children who all came out to experience the first 'Let The Kids Grow Day' at Mud Island Amphitheatre. The entertaining event, held August 1, 2008, was complete with music and messages about education, positive influences and turning away from gangs and crime. The day also invigorated kids and prepared them for back-to-school. Entertainer and entrepreneur P. Miller (a/k/a Master P) and son, Romeo, brought the event to Memphis, affirming their commitment to communities through innovative education and sports programs. The positive, fun-filled and free program, sponsored by P. Miller Clothing, Jim Finkl Enterprises, Heal the Hood Foundation, and Wal-Mart, embodied the message of positive change and also provided bags of free school supplies. 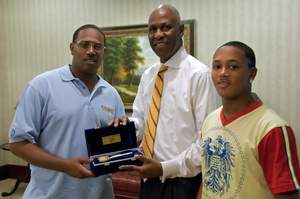 Memphis City Mayor, Willie Herenton, presented Miller with the key to the city in recognition of his positive change and commitment to youth education and empowerment. "No other rapper or entertainer is as committed to the community as Master P and I am proud of him," said Mayor Herenton. "Master P changed his life and took the negativity out of his music but stayed true to the hood." "My mission is to give inner-city kids a jump on education and the best possible start," said Miller. "I want those kids and my own kids to be better than me. I've been luckier than most to have a second chance at life. We train our kids to be good athletes, why can't we train our kids to be good students? "Being a leader is important so I stress to kids that joining gangs just makes you a follower. Believe in yourself and say 'no' to gangs & drugs and 'yes' to education. It's time for us parents to break the negative cycle and give kids a jump-start on life through education." Memphis resident David Dowell brought his two sons to the event because he did not want them to end up in prison as he did several years earlier. "I'm supposed to be at work, but I brought my boys," Dowell said. "It's beautiful." Memphis City Schools Supt. Kriner Cash attended the event, as did actor and Memphis native Morgan Freeman who brought his granddaughter with him. "Hopefully this will get young people to understand that education is important and also to help them be in a peaceful society. Memphis is ranked number one in crime. We need to stop," said Shirley Thompson of Heal the Hood. The La Petite Academy in Hickory Hill brought the 35 kids ranging in age from 6 to 12 enrolled in their Summer Treasures program. Younger kids came to see Romeo, Gee Gee the Giraffe and to get motivated for the upcoming school year. There were also older teens, like Shankira Mayhew, 18, who came to see the stars and left with positive messages about education and life. Mayhew was on the verge of dropping out of school, but after attending the 'Let The Kids Grow' program has decided to return to high school in the fall and further her education. She is now considering college to follow in the footsteps of her role model, Romeo. "'Let The Kids Grow' is a perfect example of what a community can achieve when they put their minds to it," said Miller. "I have to thank Percy T, Jim Finkl, LaDell Beamon, Romeo, Gee Gee the Giraffe, and all the volunteers who made this possible. Education is so important we need to make sure our kids can catch up now so they won't have to catch up later." Later that day, Master P and Romeo got up close and personal with their fans and signed autographs at a local Wal-Mart where their affordable clothing line, P. Miller, is now available.